Earlier this summer, The Eight-Year-Old stumbled onto the concept of derivative art. She looks up various works of art on her Daddyo’s iPad, then redraws them as portraits of Tigery. Earlier this summer, she integrated Tigery into da Vinci’s Mona Lisa and Munch’s The Scream. This week, The Eight-Year-Old and her buddy Tigery are reworking Edouard Manet’s Self-Portrait with Palette. Like any serious artist, The Eight-Year-Old first draws a study for her work, before attempting the final version. After some discussion, she agreed to let me use her works for a summer series on Caterpickles, on the condition that I tell you a little bit about the original work in the post. Unlike Manet’s other, more colorful works, this self-portrait seems to have been painted almost entirely in various tones of brown and black. Like much of The Eight-Year-Old’s own work, it also appears to have been dashed off in just a few strokes. Look at that hand holding the brush. There’s an impression of knuckles and a thumb, but very little else. 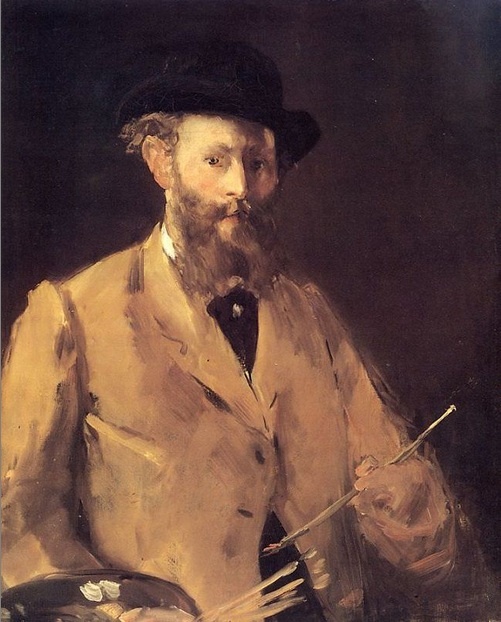 Was Manet deliberately playing off the contemporary critic’s opinion of Impressionism as unfinished work done by artists who lacked the discipline to finish their paintings properly. Or did he gloss over the details because he himself was the subject, so he felt more free to play with the ephemeral nature of Impressionist art? Maybe there’s an actual art historian out there who could comment? Regardless of Manet’s motivations, The Eight-Year-Old paid full homage to the Impressionist mantra of capturing the moment when she dashed off these portraits of Tigery with a palette. Although she respectfully disagrees with Manet on the question of color. 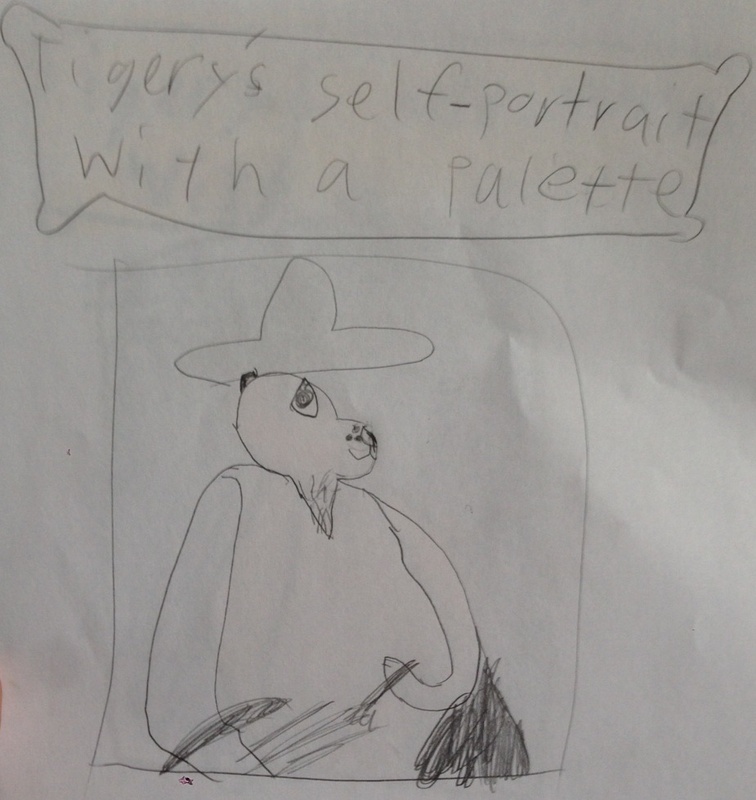 Study for Tigery’s Self-Portrait with a Palette by The Eight-Year-Old Howell. Inspired by Edouard Manet’s Self-Portrait with Palette. 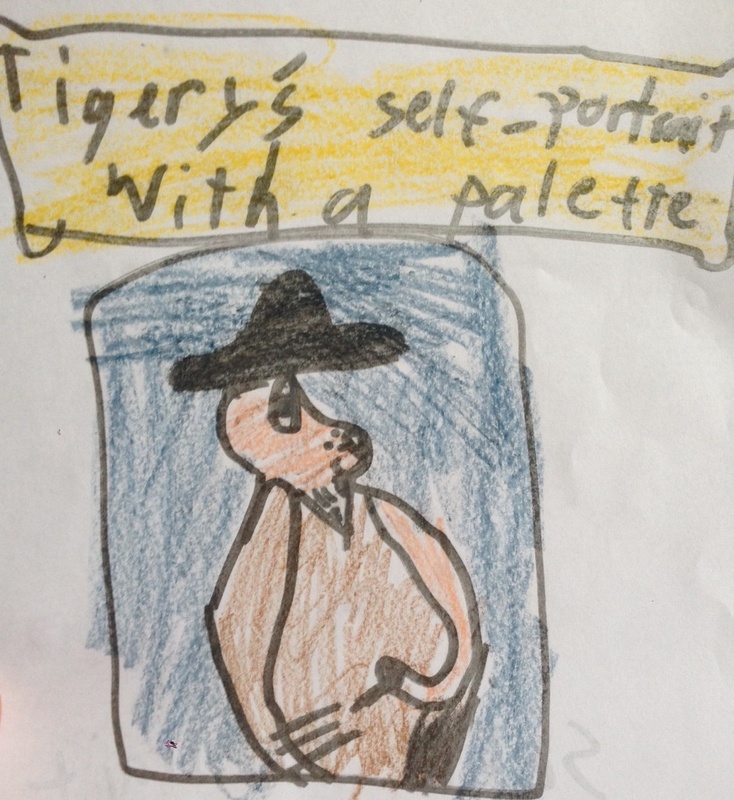 Tigery’s Self-Portrait with a Palette by The Eight-Year-Old Howell. Inspired by Edouard Manet’s Self-Portrait with Palette. I’ve said it before, and I’ll say it again, The Eight-Year-Old’s art teacher rocks.